Need some help from you 3D guys. I'm trying to cut off part of a cylinder but I've no idea how. 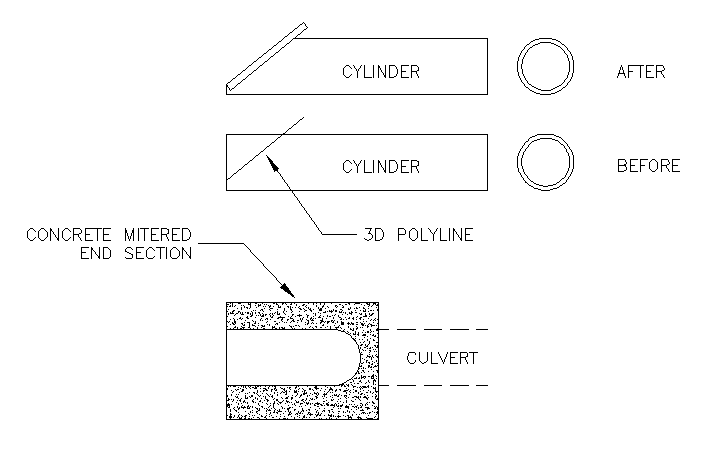 I can create the cylinder (culvert pipe) without problem but I can't figure out to slice if off. What I have is a mitered end section (concrete placed at the end of a culvert usually at about a 65 degree angle) at the end of a culvert pipe (the thing in a ditch that typically has a driveway over it). While UCS is an extremely useful command, it is not necessary in this case. All that is needed are the start point of the slice above the "invert" and the angle from the XY plane (25 deg) and the SLICE command. The following assumes the start of the slice is 4" above the B.O.P., hence the "From" "QUA" "@0,0,4"
The second point on the slice only needs a vector of any magnitude, so I used @12<0<25. The 12 is the magnitude, the first angle "<0" is IN the XY plane and the second angle "<25" is FROM the XY plane. Then just select the portion to keep. Once you get familiar with 3D this kind of slice manipulation becomes second nature. For the neophyte, the UCS method is easier, if more steps are required. hey ... watch the name calling bud ... and yes the UCS command IS easier and faster than attempting to calculate offsets ... Stick with the UCS it is better .. I don't care what CADaver says .. If you know enough to set the UCS, that is all you need for slice. And where I am, one command is easier and faster than 2 commands... but I understand that certain parallel universes have it the other way round. BTW, no offsets were calculated at all. what Keith said..........first y'gotta figure all them angle thingies out, then y'gotta TYPE 'em! Gimme a couple'a clicks any time! How did you define that particular UCS with just a couple of clicks? NOTHING needs to be figured out, the angle is already known. If you know enough to set the UCS, you know enough for the slice. is a 2D representation of what he wants. If you know enough to draw the line, you know enough to make the slice, without drawing the line or changing the UCS. NOTHING to figure out, nothing additional to key in. You need to read the post again .. besides, if it is ONLY a 2d representation, then he doesn't need to slice anything now does he.